Test preparation app for MBA aspirants in India. 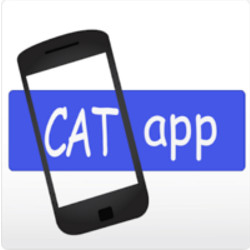 CATapp is a simple, awesome and an award winning (mBillionth Award 2013 South Asia) app to prepare for competitive exams like CAT, CMAT, XAT, SNAP, etc. on-the-go with its latest features like CATapp Store, Cloud Sync, Notifications and more. Specially curated material and content from various publishers across India are now exclusively available on this Android app. Only CATapp brings decades of experience of various coaching institutes for CAT, CMAT, XAT, SNAP etc. into this one incredibly simple and amazingly helpful app. View test papers for your exam preparation prepared by top coaching institutes and track your progress from “just an aspirant” to a “student at a Top institute across the globe”. CATapp is first-of-its kind mobile application in its category with beautifully designed and pleasing interface. You have one more reason to love your Android phone! **NEW** There’s a paper for that. -- CATapp Store is the most exciting thing we’ve launched in this version. -- 16 original CAT papers come included in CATapp with detailed solutions to over 500+ questions. -- Download numerous tests (with solutions) prepared by various coaching institutes for various exams like CAT, XAT, GRE, GMAT, etc. -- ‘Featured’ papers are handpicked by our editors to give you the best-quality test papers. **NEW** When there’s rain, there are clouds. -- Cloud Sync capability takes us way ahead of our competitors. -- Long-press a paper and move it between device (your Android phone) and our servers (on Cloud) seamlessly. -- Manage your phone’s memory by storing the learning material and papers on our servers, after you use it. -- Get back the materials and test papers from our servers to your device in a matter of seconds. **NEW** It rings and hence you can’t miss it. -- Get notifications to stay updated of new materials inside the app. -- Get notified of Question-a-Day to sharpen you skills daily. -- Stay tuned with the strategies of toppers in Topper’s Say section. -- Never miss an important announcement from any university or college. **IMPROVED** Stretch to your limits. -- Get your results and track your progress after every test you’ve attempted. -- Take tests category wise (E.g. : Geometry, Probability, Verbal Ability, etc.) and improve on your weaknesses. -- Take timed and un-timed tests. -- Red, Yellow and Green colours on progress bar signify average, good and excellent respectively. **IMPROVED** If you don’t love it, well, you don’t love it. -- New typography makes it even better to use CATapp. -- Performance on some screens has been made smoother and better. -- Test-taking experience has been made simpler with swipe gestures. **MUST-HAVE** Flaunt it when you own it. -- Get it, use it, and flaunt it by sharing the app through Facebook, Twitter, Email, Messages and Whatsapp.